Brenda Oig at Literary Life and Therese Walsh at Writer Unboxed discussed on their blogs some fictional characters that were most influential to them. Although there were some fictional characters that had influence over me, non-fictional characters have completely eclipsed them. You may be thinking, “well of course” but these are a special breed of “real” people. As a young man, I had this burning passion to be a writer. I wrote some fiction (sci-fi was my favorite). Characters from Sci-Fi greats like Ray Bradbury and Bruce Sterling had a lasting affect on how I felt about the power of words and the human mind and spirit. But when I read Carlos Castaneda, Paul Twitchell, Robert Monroe, Oliver Fox and others it changed my life on every level forever. Even my desire for writing was radicalized. These were researchers, spiritual leaders, and normal people with an obsession for the occult, mysteries, and wonders of humanities potentiality and purpose. They claimed to have out of body experiences to other dimensions, have psychic experiences, meet anchient god like masters and other things that I can’t even categorize. What fascinated me was that not only did they talk about para-psychological, mystical, and other unexplainable phenomenology that was stranger and more intriguing than Science Fiction, but (even more shocking) also they claimed these otherworldly adventures really happened. This provoked and, at times, terrified me! The mystery of whether or not it was all true was what drove me to know more and more. Over the years the shock has subsided as I now have a body of knowledge from which to cross-reference everything some of these people claim. In many ways these people I have mentioned have become fictional and even mythical characters. I found out that ex-Scientologist, Paul Twitchell may have actually plagarized volumes of works of other “real” mystics and there is also controversy surrounding Carlos Castenda’s works. But regardless, the words of these fictional/non-fictional people set me on a path that even over 20 years later I am still on. For me, those who have been brave enough to live life to the limit and then go beyond are my heros. I hope that someday I can have the same impact on those hungry for truth and curious about what lies beyond this world. Note: this is my personal perception of Tenzin Wangyal Rinpoche’s book, The Tibetan Yogas of Dream and Sleep. If you want more information or disagree, remember, I’m merely an ignorant savage with an oppinion. “*” indicates my personal observations and/or oppinion. The Tibetan Yogas of Dreams and Sleep by Tenzin Wangyal Rinpoche is a reflection of some of the beliefs, traditions and techniques of Tibet Buddists. *Although the tibetan yogas speaks about lucid dreaming it is actually much more and way beyond that. *The book is profound if one is interested in lucid dreaming or spiritual enlightenment. 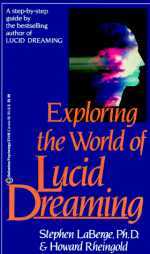 It is refered to by Stephen Laberg, Ph.D, author of world renound book Lucid Dream more than once. Laberg’s mention and praise of Tenzin and Tibetan Buddhism led me to read this book.